Call 828-270-7585 to schedule your first appointment. For hearing aids in Morganton, NC, the hearing care specialists at Miracle-Ear® can serve you. We have over 1300 locations throughout the nation, and we sell a variety of products at our hearing aid centers. Our caring specialists can assist you in finding hearing aids that are right for your specific needs. Each of our locations is independently owned and operated. We hope you’ll come and see for yourself why we’re America’s most recognized brand of hearing aids. Our center proudly provides advanced hearing innovations, including hearing aids with our GENIUS™ Technology. GENIUS™ Technology incorporates multiple features that operate in sync with each other. These features transition smoothly with changes in the acoustic environment. The Directional Focus feature enables one to hear front and center while filtering out surrounding noise pollution. Wireless Windscreen filters out interference from wind noise and enables natural sound to come through more clearly. VoiceTarget allows a listener to zero in on people and conversations in any direction. When you choose hearing aids with GENIUS™ Technology, you can conveniently and discreetly control them from your phone using the GENIUScontrol app**. The app lets listeners change volume, hearing programs, treble, and bass. It works by sending a frequency signal to the hearing aids without using extra hardware. It is free to download and works with all hearing aids utilizing GENIUS™ Technology. Call Miracle-Ear or stop by our hearing aid center if you live in the Morganton or Drexel area. We offer a 30-day, risk-free trial† period. Our products also come with a three-year warranty††, and our complimentary aftercare package includes regular checkups and hearing aid repairs. We’ll see that your hearing aids continue to work right and fit well. We also replace batteries and clean hearing aids. In 2012, Wendy joined the Miracle-Ear family and began her career as a Hearing Healthcare Professional. 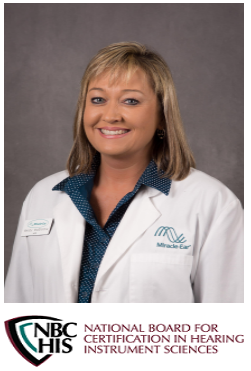 As a member of the International Hearing Society and a Miracle-Ear nationally Certified Hearing Care Professional, Wendy takes great pride in having the knowledge, skills, and ability to customize solutions for each of her patients with their need for better hearing. She has received multiple certifications in the areas of Health, Science, and Insurance. After graduating from school, Wendy's goal was to pursue a career where she would enjoy her profession and truly have a positive impact on people�s lives. There are few careers that offer that opportunity, but none fit Wendy more than the role of a Hearing Healthcare Professional. She loves to go to work every day and see how better hearing changes the lives and well-being of her patients. Wendy is sensitive to the needs of each patient. When she sees the expressions on her patients' faces because they can hear again, it is truly satisfying to her. She has a passion for helping others and she thoroughly loves what she does. Wendy has lived in North Carolina her entire life. Being close to her family is very important to her. Wendy's father, mother and sister are all here with her in the Morganton and Lenoir area. She is proud to be the mother of a wonderful young man who enjoys the Carolina Mountains as much as she does. In her free time, Wendy enjoys being outdoors, camping, hiking and spending time with her family, friends and her dog.